Brasiliana – Journal for Brazilian Studies is a dynamic academic forum whereby scholars from diverse disciplines in the Humanities and Social Sciences can publish their research and draw on scholarship within the interdisciplinary field of Brazilian Studies in an open access platform. 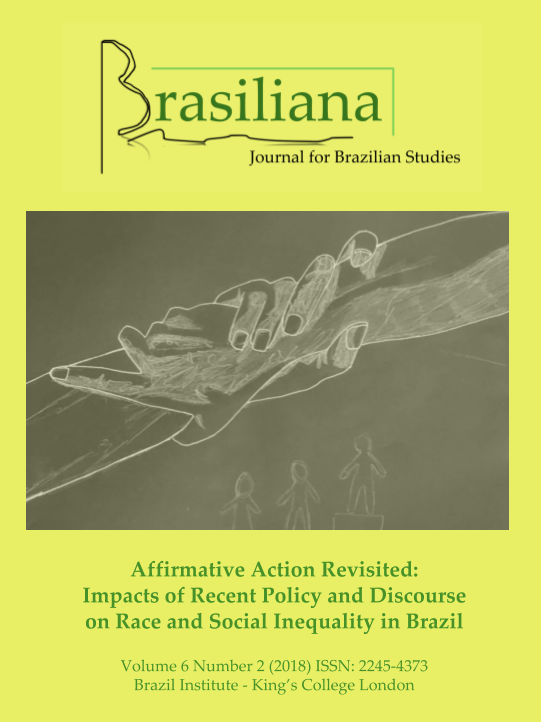 Brasiliana – Journal for Brazilian Studies will be publishing an issue in late 2019 foregrounding recent scholarship on Afro-Brazilian studies in a multi-disciplinary dossier. Following recent international initiatives such as the United Nations declaring the “Decade for People of African Descent” (2015-2024), this dossier seeks to bring together contributions and reflections on the theme in Brazil and beyond, fostering dialogues with the international scene, especially those referring to the broader connection with the African diaspora. The Journal is currently accepting articles on the various aspects of this field from the perspective of a wide range of disciplines in the humanities and social sciences which have engaged with this topic (anthropology, sociology, law, history, economics, linguistics, literature, music, cinema, visual arts). Brasiliana also welcomes interdisciplinary approaches and those that take on themes relating to public policies, participation, action , and the Afro-Brazilian struggle and experience. This issue will be the first edited by Dr Felipe Botelho Correa (King's College London), who is stepping in as the new Editor-in-Chief of the Journal. The editorial team would like to thank Dr Vinicius Mariano de Carvalho for all his work in creating and editing this journal! Articles should be submitted online before 15 June 2019. The journal Brasiliana continues to accept submissions of articles and reviews of recent publications related to Brazilian studies, which are published regularly.